Not a stitch of evidence of what uses to be at this address. Work going on inside. The world does not need a single additional cupcake joint, I say. I've spent the last couple years watching Chinatown's classic Nom Wah Tea Parlor be repeatedly shut down and opened up by the Department of Health, and wondered, with a sick heart, how long it would be before the 90-year-old place closed for good. So the article that appeared in today's Daily News was like a balm to my worries. 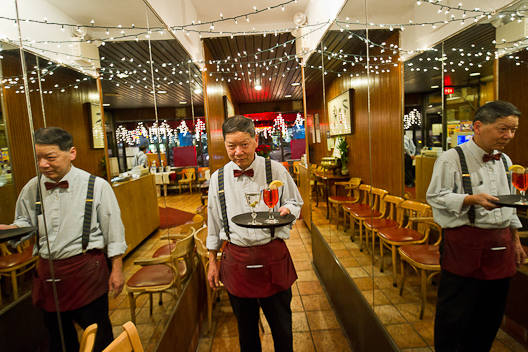 Wilson Tang—whose uncle Wally Tang bought the place in 1974, worked in the eatery for 60 years, but retired last year—has left his job in finance to take over the tea parlor. While he preserved the original dining room, Wilson renovated the kitchen, a process that took six months. He is keeping things as they've always been, but making critical changes which I think will help ensure the joint's longevity. "With Wally's blessing, some additions will be made to both the tea and food menus," reads the article. 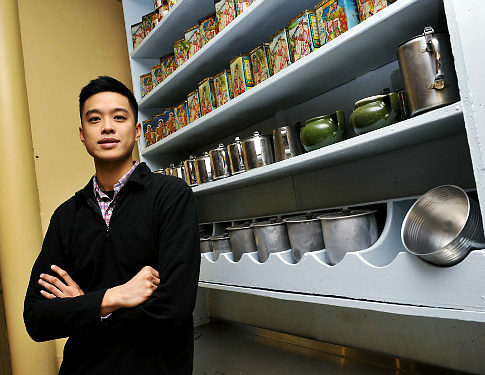 "Wilson is keeping the same 10 traditional Chinese teas that his uncle always served, but is thinking about adding some more Western flavors, like Earl Grey. Tea is integral to the dim sum experience, Wilson explains, because it washes away the oily taste of the dumplings before the next dish. "Nom Wah's food menu is being expanded. It used to feature nine traditional items — including ha gow (a traditional Chinese dumpling), woo gork (taro root dumplings) and lo mein (traditional wheat flour noodles) — written on the back of a business card. "The new menu includes a fried or steamed dim sum sampler with eight pieces, as well as roast pork buns, fried sesame balls, and sweet and sour spare ribs." Wilson is also going to take advantage of his trendy neighbor, the cocktail lounge Apotheke, which is planning to open a Mexican restaurant called Pulqueria in the vacant space between it and Nom Wah. A Second Avenue Deli van parked right opposite where the deli used to be, a space no occupied by a Chase bank branch. Courtesy of EVGrieve. McHale's Bar—the closure of which Times Square watering hole led to the creation of this blog—has been gone for five years. It was pushed out in January 2006 after 62 years in business by the rent hike of a greedy landlord. There was hue and cry from its clientele and the air rang with protests, but it was all for naught. Owner Jimmy McHale (above), son of his father (also named Jimmy), who founded the place, moved out quietly and let the condo tower known at Platinum NYC rise on the northeast corner of Eighth Avenue and 46th Street. The monolith stands there still, offering no hints as to the intersection's former resident. The stagehands who had made the bar their home moved grudgingly around the corner to the Playwrights Tavern. At the time of the shutting, Jimmy McHale made some vague comments about the bar reopening some day. But nothing came of that. The chef moved on to Rendezvous, an eatery across Eighth Avenue, and for a time that place advertised McHale's burgers on their menu. But soon enough, that place closed as well. Jimmy said he was saving much of the interior and the classic neon sign. However, in 2007, one of the McHale's signs turned up in a Chelsea antique shop. And in 2010, Lost City discovered that the biggest of the McHale's neon signs had found a new home in Emmet O'Lunney's on W. 50th Street. The owner apparently made an offer on the sign in the days before McHale's closed, and Jimmy McHale took the deal. The sign was restored and installed. So, I'd say there is zero chance of a new McHale's rising from the ashes. I wonder what became of up the joint's long wooden bar, which hailed from the 1939 World's Fair. I hope some bar somewhere is using it. If anyone has any news of it, or of Jimmy's whereabouts, please write it. I still have the McHale's t-shirt Jimmy himself gave me on my final visit to the bar. I don it only occasionally. I don't want to wear it out, because I know there won't be any more coming to me. Unique ways of eating hot dogs is a New England tradition. I learned this during my 2009 jaunt to Troy. Providence, Rhode Island, has it's own peculiar frankfurter traditions. First of all, their called weiners. Don't call them anything else. And they're served automatically with mustard, meat sauce (really, a kind of chili), raw onions and celery salt, unless you specify otherwise—and you would never do that. In other neighborhood news, the revamp from Naidre's to Maybelle Cafe, at the corner of Henry and Sackett, is complete. There were selling coffee this morning. Almost a bucolic scene, the sight of these berried branches enveloped in white. Every branch in the neighborhood was bent under at least a couple inches of snow. Quite a pristine scene, the blinding whiteness persisting even as we approach noon and much of the shoveling and plowing has been done. Good snowball snow, too. 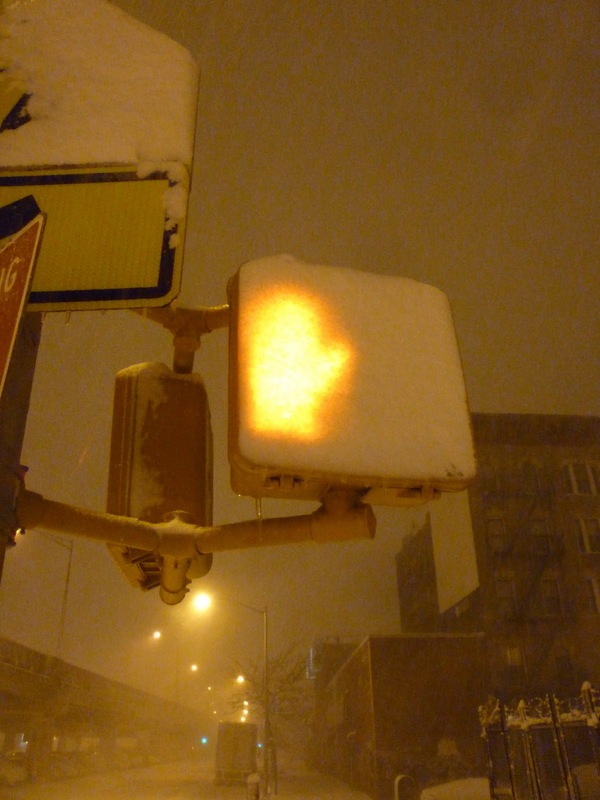 Driving snow at 10 PM in north Williamsburg. Not a car on the street. Bamonte's shuttered up well before quitting time. People walking down the center of the street. And some fool standing around taking pictures of it all. I never thought I could feel tenderly toward the Dunkin' Donuts chain until I visited Providence. Providence loves donuts, and consequently loves Dunkin' Donut. There are more Dunkin' Donuts per capita in Providence (a city of 170,000) than there are in any other city in America. They are so prevalent and so beloved that they are used in giving directions, as in "You go straight and then take a right at the Dunkin' Donuts." In fact, I am told, people actually give directions based on where a Dunkin' Donuts used to be. Dunkin' has returned the love. The bought the naming rights for the indoor arena that became known as the Dunkin' Donuts Centers. Locals call it "The Dunk." It all contributes to that rare phenomenon in which a national chain actually feels like an integral paint of the local cultural fabric. I still don't like Dunkin' Donuts. Don't like their product, their obnoxious signs, their ubiquity. But I kinda like that Providence likes them. Federal Hill, the Italian province of Providence, Rhode Island, is home to a quantity of Italian restaurants and bakeries to match any of New York's Little Italys, and a great many of them are of significant age and boast the most wonderful of old neon signs. The one above, to Joe Marzilli's Old Canteen, is my favorite. Dates from 1956. Pink tablecloths inside. Kind of place you go after your kid's graduation. The joint's sign around the corner (it sits at an intersection) is even better. Not sure of the age of Cassarino's. Lovely signage, though. Camille's is the oldest of the Italian restaurants along Atwells Road. Founded in 1914, in it's current location since 1919. 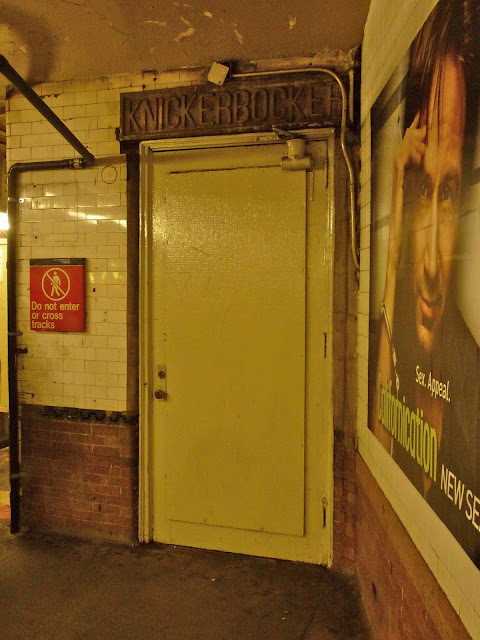 After four years being hidden from the public, the historical locked door marked "Knickerbocker" that is located in a corner of the Times Square subway station's Shuttle platform has been uncovered once more! Back in early 2007, the metal door—which had once led directly to the Knickerbocker Hotel, a fashionable place for a short time in the early part of the 20th century (the building is still there, at the southeast corner of Broadway and 42nd)—was covered up by plywood painted blue. It remained that way while unknown construction work was being done within the shed. I feared that the door, which is beloved by history buffs like myself, would be removed. But yesterday I saw that the scaffolding was finally down, and the door was just as it was. I didn't see any improvements to the area, so who know why the section was boarded up in the first place. 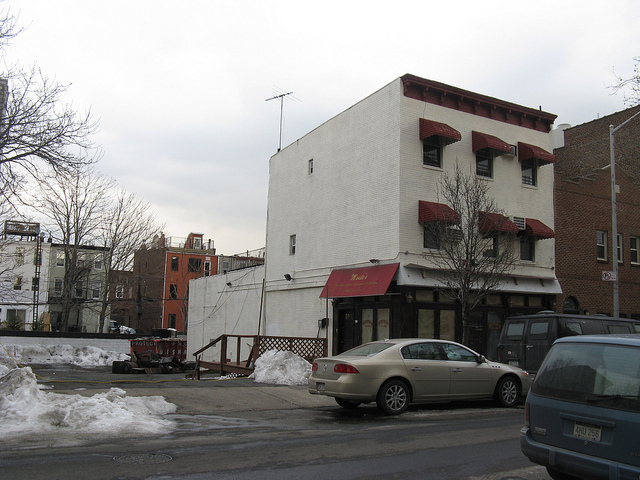 I had given up Monte's Venetian Room—purported by some to have been the oldest Italian restaurant in Brooklyn—for dead. It mysteriously closed up shop in fall 2008, and has been quiet as the grave ever since, gathering dust inside and out, even as the interior remained intact. But recently Pardon Me For Asking noticed that the Gowanus restaurant (located on Carroll near Nevins) noticed some activity around the property. There's a dumpster outside and paper on the windows, which indicates to me that the insides are being either gutted or renovated. Complaints filed in January with the Building Department state the work was begin done without a permit. Monte's was founded in 1906 and is one of the last remnants of what was once a thriving Italian community along the Gowanus Canal. Frank Sinatra was rumored to be a patron (but then he seemed to have gone to every New York Italian joint at least once). It was last owned by Toni Monti. Nick Monte, his father, died on Oct. 13, 2007, at age 90. The Carnegie Deli, one of the few Jewish deli standard bearers left in Manhattan, is in danger. According to the New York Post, the Seventh Avenue institution "has had a cordial, decades-long relationship with adjacent property owner Woodward Affiliates, which has allowed Carnegie to use a portion of its property for $2,500 a month. The extra space allowed the deli to provide seating for up to 200 people, as well as a legally mandated second exit door. Any agreement between Carnegie and Woodward, which owns 200-210 W. 55th St., has to be approved by the city Buildings Department, but just as the two sides were working out a new deal, Woodward balked, Carnegie claims in a Manhattan Supreme Court lawsuit filed last week." This snag may somehow lead to the closure of Carnegie, though I'm not clear why. Maybe they need those extra 200 seats to survive. Sounds to me that Woodward is just angling for more money. I'm not giving up on the Carnegie yet. Both it and its neighbor, Stage Deli, periodically throw up death cries, and usually the issue is somehow resolved. I'm not among those who like to bash the place, saying it's a tourist trap, the service is rude and the prices too high. All of these things are true to an extent, but think of it—the deli is unique and once it's gone, it's gone, and nothing like it is going to come along anytime soon. Carroll Garden's classic pastry shop Monteleone Bakery, which has roots in the neighborhood going back to 1902, has been through a lot of turmoil in recent years, undergoing a renovation, briefly joined forces with the Cammerari Bakery, and being put on the block. Now the venerable old store—which many in the area agree has fallen off its game lately—is under new management. The new owners are a husband and wife team with long experience in the pastry biz. They hail from Bensonhurst, another Brooklyn neighborhood known for its Italian-American population and find bakeries. All who celebrate Christmas have been guilty from year to year of procrastinating in the taking down of decorations. Sometimes they linger until Jan. 1, Jan. 15, and further. The last merchant to take down their holiday trappings on Court Street is always Sal's Pizzeria. Last year, their whirling white Christmas trees were out on the sidewalk until March. This year, they're on their way to another record. 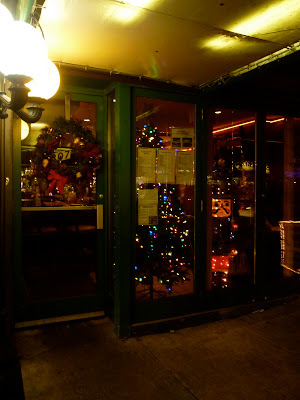 Maria's, their affiliated restaurant, still has a tree, a wreath and all sorts of lights up, with no sign of there exit in sight. Is the owner sentimental? Or just lazy? The latter, I think. When I first moved to New York 23 years ago, I lived a couple blocks from this Stop One deli on the corner of Allen and Stanton. I visited it from time to time, and I can tell you that it was a kind of beacon in what was then a stick foreboding and dangerous area at night. There was little else around it that stayed open late into the evening. With all the changes the LES has gone through in the past decade, I'm surprised it's still there. It looks better now, slicker. The sign was clumsier in the early 1990s and the windows forever filthy. And it sure was calling itself a "gourmet deli." I like that it hasn't been shoved out yet by the onslaught of clubs, boutiques and bars. I showed there's still room for a shabby little New Yawky business on the Lower East Side yet. While we're on the subject, what is the deal with the Stop One delis? You find them scattered across the city, though not many of them. And they're usually in the most ramshackle neighborhoods. Is this a chain? Are these franchises? They don't seem to be related in any way, but they bear the same name and sometimes the same signs. They're sort of the Ray's Pizza or Blarney Stones of the deli demi-monde. 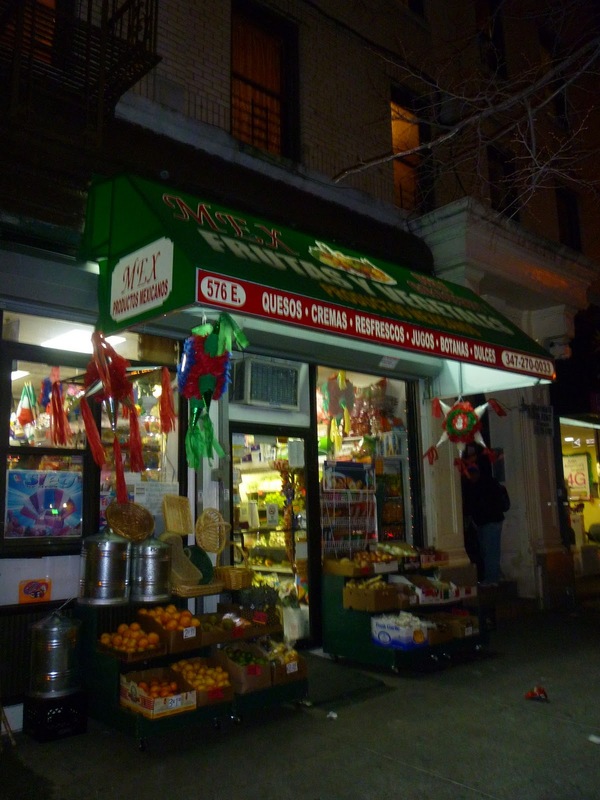 One of the landmarks that had always made the Bronx's Little Italy of Arthur Avenue so special to me was an outdoor green grocer called Amalfi. 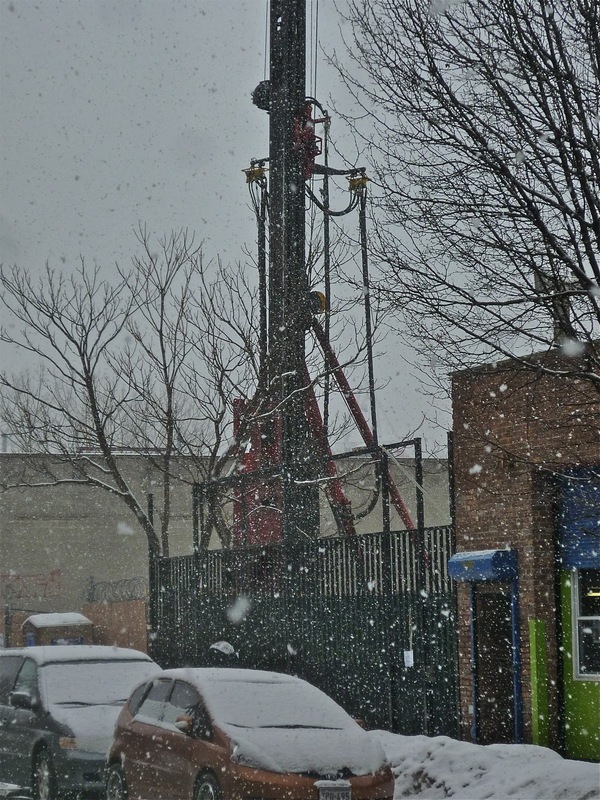 It stood on 187th Street just west of Arthur Avenue. It was run by a very old man. His crates and boxes of vegetables and fruits spilled out into the street in a pell-mell fashion. The arrangement of goods was haphazard but the overall effect was artful. One couldn't help but smile when looking at the colorful business. It was a slice of pushcart-era New York that had refused to leaven. Upon my most recent visit to Arthur Avenue, it had disappeared. I was heartbroken. But I was more disconcerted by the way it had disappeared without a trace. I walked into the store that had replaced it (another indy shop) and asked what had happened to Amalfi. The worker had never heard of it, didn't know anything. I went into the neighboring stores—nobody remembered it. How could such a special place disappear without a bit of mourning? Some pictures came out of the revamped the Rum House, the beloved (in this quarter, anyway) Times Square watering hole that is being reborn as a somewhat swank cocktail joint. Can't say I'm unhappy about what's going on. The redo looks pretty faithful to the former look of the place, which its nautical theme. I'm thinking it may now look like the Rum House possibly did when it opened for business in the early 1970s. Certainly, it's good to have that grimy carpet gone. And it will be nice to be able to order a good rum cocktail in a place called the Rum House. Opening is Monday. Italian-American diners and Italian-American restaurateurs must be the most loyal in the city. How else to explain Bamonte's, Frost, Ferdinando's Fococceria, Marco Polo, Mario's, Pietro's, Tommaso's, Rocco, John's of 12th Street, Lanza, Rao's and countless other steadfast eateries that, despite predictable cuisine and often interchangeable decor, peel away the decades without breaking a sweat? How else to explain Gargiulo's, which since 1907 has remained rooted to its bleak block a couple hundred yards from the boardwalk, even as the rest of Old Coney Island tumbles down around its ears? I'd been planning to visit Gargiulo's for years, but was spurred to action by food critic Mimi Sheraton's recent castigation of the contemporary Brooklyn culinary scene. "When Lundy’s was Lundy’s, I’d be there," said Sheraton, a sometimes commenter on this column. 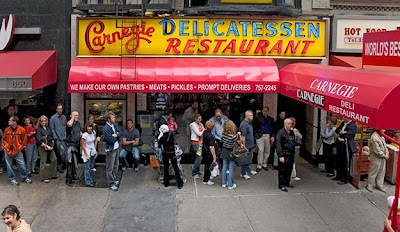 "When Gargiulo’s was Gargiulo’s, I went. I certainly went to Gage and Tollner." Well, I can't go to Lundy's or Gage & Tollner anymore, but I can sure hit Gargiulo's, even if it isn't what it "was." The exterior is anonymous; an awning on a faux-classic facade. The inside, however, is Ancient Rome by way of the Marriott Grand Ballroom. It's the Banquet Halls of Caracalla. The ceilings of the main dining room—just up a flight of steps from the bar and copious entryway—must be among the highest of any restaurant in New York. Arched mirrored windows line the walls; chandeliers drip from the ceiling. Two large doors lead to what is essentially an open (or at least very visible) kitchen. A huge cherub oversees the festivities. One senses that large parties celebrating birthdays and weddings are rustling somewhere in the building, behind this door or up that staircase. The place has been a wedding and function mecca since it was founded by the Gargiulo family and continues to be so under the Russo clan, who bought it in 1965. 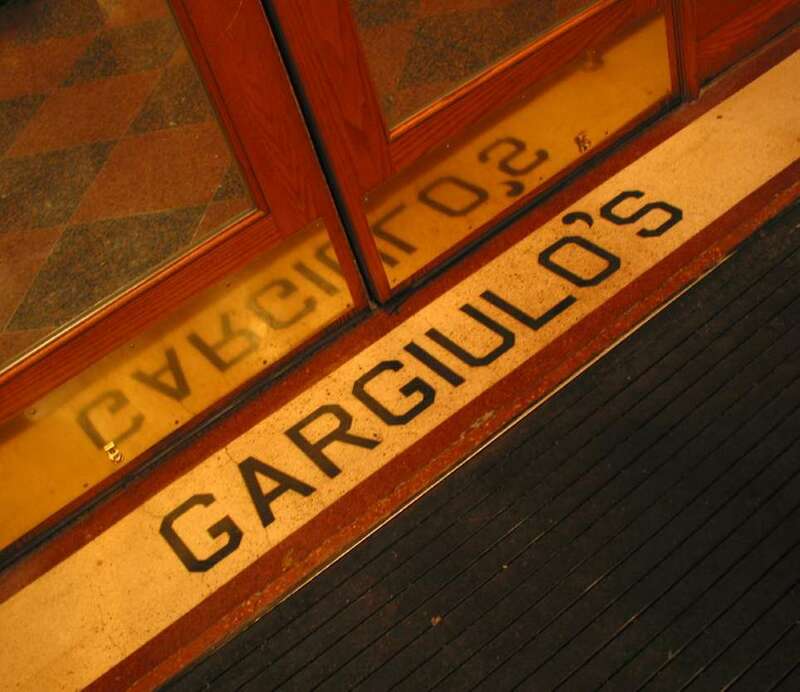 The head waiter—tall, good-humored, Russian and excellent at his job—told me Gargiulo's has always been cavernous. It was built to match the outsized personality of vintage Coney Island. Old pictures bear this out, though red curtains and a huge octopus suspended from the ceiling once lent the room a more colorful, carny air. "We cut the octopus up for salads," smiled the waiter. "Just kidding." The Russos are captured in oil in a gallery of portraits just to the left as your walk in. A flesh and blood Russo could be found at the bar, filling out a large sweater, and holding an Old Fashioned between thumb and index finger like it was an egg. Many patrons took breaks from their meals to saunter down the steps to the bar, shake the Russo man's hand and examine an "American Idol" contestant or two. It's the kind of place that encourages roaming. A party of 30 called at the last moment and was accommodated immediately. A birthday party suddenly emerged from some unseen hall, shiny balloons bobbing up and down as they meandered through the room. Old friends talked over wine long after dinner was over. Kisses and hugs were exchanged between tables when it came time to go. Every few minutes, an aged family member emerged from the kitchen in soiled whites, leaned against the doorway and wearily surveyed the scene to make sure everyone was happy. For the volume of food they produce, the kitchen works with a certain delicacy. My fettuccine verde Gargiulo, topped with a creamy tomato sauce rich with bits of chicken and prosciutto, was tasty and far from sloppily prepared. My crabmeat salad was fresh. The bread was good. And the house Chianti was not crap (a minor miracle in the world of red sauce joints). At a neighboring table, the waiter offered to remake a dish when the customer briefly considered whether it was too salty. I heard many comment happily about their meals. These people came from "New Jersey, Long Island, Staten Island, all over," said the Russian. "Many regular customers." He then shook the red, plastic tombola that he brings to every table of ten or fewer at the end of a meal. It's a longstanding piece of Gargiulo's schtick. Pick a number between 1 and 90. If that die comes out, your meals on the house. No one had won that night yet. I chose 31; I got 60. "Sometimes you eat free, sometimes you don't," said the waiter. "But always, a good meal." Labels: coney island, Gargiulo's, who goes there? How to Get Your Phone Number Burned in Customers' Brains. 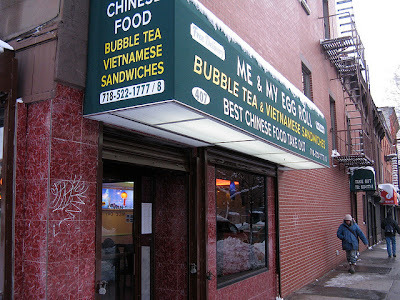 A Chinese take-out joint in Belmont, The Bronx. 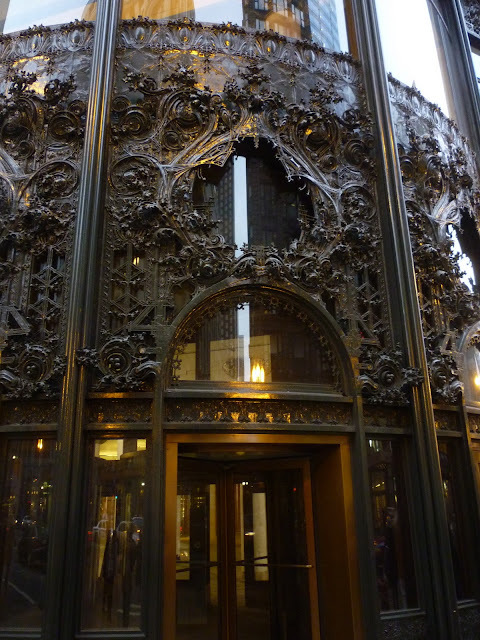 The Carson Pirie Scott Building on State Street, one of the greatest achievement of architect Louis Sullivan, and a one-time commercial anchor of downtown Chicago, remains vacant and empty, three years after the department store chain abandoned its flagship home. I was in Chicago recently, and decided to check out the downtown for the first time since it was gutted of all soul by the swift departures of Marshall Field's, Berghoff's, and Carson Pirie Scott. Field's is now a Macy's and some Chicagoans I spoke to are still angry about it. But at least the grand building is open for business. The Scott structure, just two blocks to the south, is a sad ghost of itself, the breathtakingly ornate cast iron frontage put to no use. Supposedly a Target may inhabit the space. Is that better or worse than it's remaining empty? Isn't it awful that the only businesses today that can use a grand space such as this are the soulless, big-box chains the blight our landscape? Chris Smith of New York Magazine, in this week's issue, gathered together four commentators to debate the question "Who Was New York's Greatest Mayor?" They were: John Mollenkopf, Distinguished professor of political science at the Graduate Center, CUNY, and director of its Center For Urban Research; Jennifer Cunningham, Media consultant and political strategist; Bob Hardt, Political director and executive producer, NY1; and Rev. Al Sharpton. By the end of the discussion, many were leaning in favor of Michael Bloomberg being the best man to have served in City Hall. And this is why their conclusion is useless. They apparently reached it without discussing two things. One, the fact that Bloomberg stole his third term, rigging the system in such a way as to render him as corrupt a pol as any who have served the City, little more than a power-grabbing Tammany boss. Two, that he has, over 10 years, created a New York that is possibly the most un-New Yorky of New Yorks that ever existed, homogenous, anodyne, bland, one dominated by the wealthy and the corporate, by condos and chain stores. And this is the man they concluded was New York's best mayor. Truly breathtaking. Also, there's the small point that they didn't consider any mayors who served before LaGuardia. Read the clueless confab here. 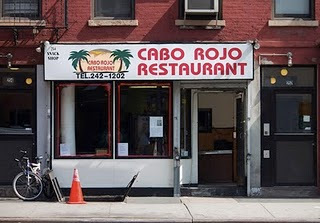 JVNY brings the sad news that Cabo Rojo, a 51-year-old Puerto Rican eatery in Chelsea, has closed. It lost its lease. I never went, sorry to say. Tenth Avenue in Chelsea and I have only a passing acquaintance. Can't remember the first time I went to Charlie Mom. But it was many years ago. It seemed old then. It seems old now. It's also very comforting. One of the better port-in-a-storm places in the Village. No shocks. No worries. Found out that one of the restaurants on my list of WGT candidates, Gonzalez y Gonzalez, will be closing after a couple decades plus in business. Now I'll never find out why the owners never replaced the bulbs in the neon sombrero when they went out. I would not be surprised if told Charlie Mom was founded in 1963, but it's only been around since 1983. It's the sort of Chinese restaurant that was once seen in abundance in New York, the kind that makes cocktails and offers choices from Column A and Column B, and a Peking Duck meal for $19.95. The odd space is L-shaped, the entrance on Sixth Avenue dominated by the large take-out and delivery operation. Many delivery men hang out near the cash register waiting for their marching orders, and there are more than enough chairs and benches for all of them to be seated four times over. Follow a mirrored corridor past the kitchen doors and look to the right and you'll find the dining room, which looks out on 11th Street, and has the feeling of a santum sanctorum. It's a good size and there are always a number of people who have chosen to dine in. They want a comfortable meal with little of the attendant fuss to be found at more formal restaurants. Labels: Charlie Mom, greenwich village, who goes there? 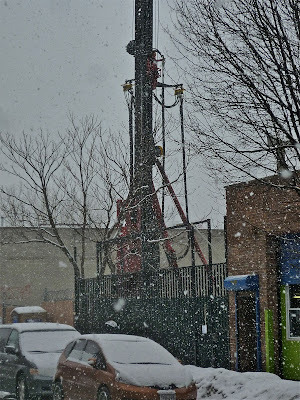 A big piece of machinery sticking out of a the plot on Summit Street that used to hold Gowanus Nursery. What's that mean? Means the nursery, there for four summer, and generally brightening up the bleak block is gone, and two town houses are going up. But all is not lost. 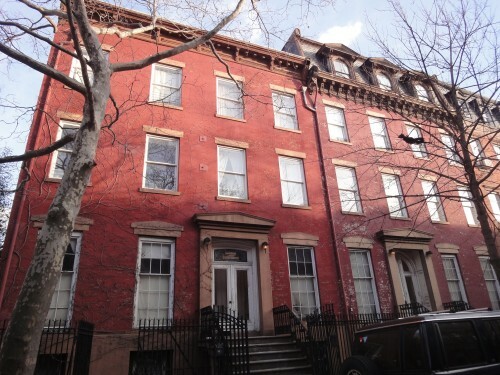 The nursery is reopening in March at the corner of Carroll and Van Brunt, just a block away. Brownstoner unveils the interesting news that the two buildings at the corner of Henry and Kane in Cobble Hill—a longstanding obsession of Lost City—have been sold for $5.4 mil. In the late '60s-early '70s, the building was used by the Int'l Society for Krishna Consciousness. Many of the windows have been broken for a long time. I've often wondered if anyone lived in there. 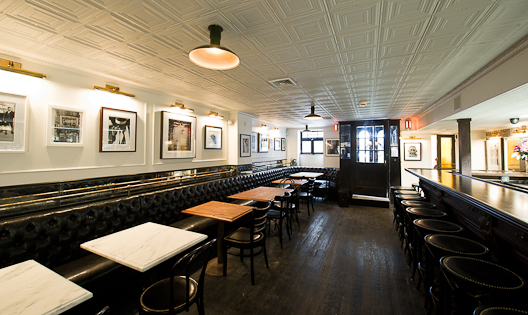 There was much talk when restauranteur Gabe Stuhlman took over the old school Greenwich Village haunt Fedora that he would honor the spirit of the original owner and eatery. But talk is cheap. Things didn't look good when Stuhlman chose not to keep the original neon sign (which should have been landmarked long ago), but replaced it needlessly with a facsimile. 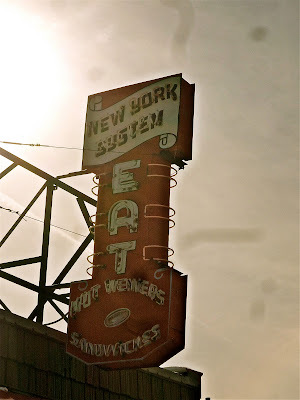 (Stuhlman told JVNY that he has saved the old sign and will use it somewhere.) And now photos have been released of the interior. The above doesn't look anything like the Fedora I remember, aside from the egress being in the same place. Fedora was dark as night, and rustic in the extreme. This place could be in the Hamptons. The bar's in the same basic location, but I can't tell if it's the same bar. 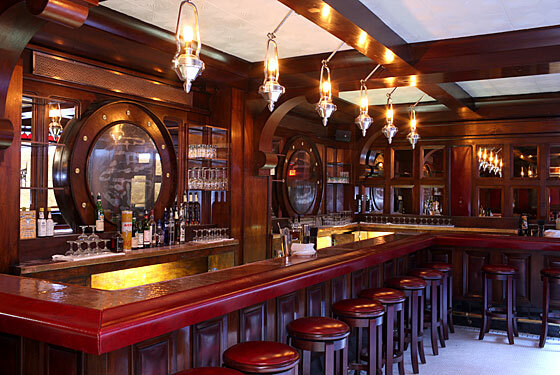 According to Eater, "much of the bar" is the same, but the ceiling and floor are not the same. (Another report says the floor is the same.) I remember talk of the old cash register being kept, but I don't see it. And who needs trite photos of Monroe and Warhol; any bistro in Topeka can hang those worn images on the wall and call itself classy. I wish the restaurant well. (And I respect the way Stuhlman actually responds to worrisome cranks like myself, explaining his motives and reasoning.) At least the name is the same, and fans of the old place can go in and dream. If fact, I'll probably go myself. Just, you know, sigh. 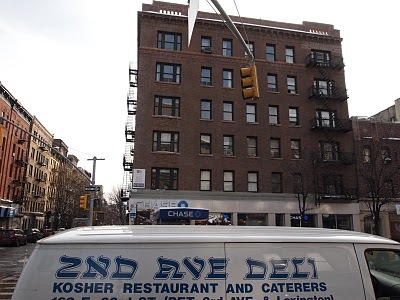 One years ago we visited 259 Bleecker St with some brokers unknowing that was the famous Zito Bakery. We weren't interested in this location: expensive and totally to rebuild. Sometime later we read/eard the Zito's Story and we decided to take over that location. We felt in love with it, definitely! Now we are almost done...We hope to open as soon as possible because we spent such as one year with contractors, plumbers, building department, health department, landmark commission...delays and delays...scheduling and rescheduling..
Over the years, I have loudly bemoaned the sorry state into which to former Zito Bakery in Greenwich Village has fallen. No tenant for seven years and the facade defaces and broken and boarded up and defaces again. 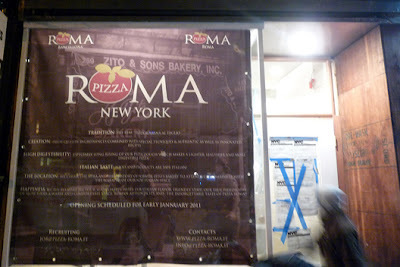 So it's good news that Roma Pizza, a restaurant group with locations in Barcelona, will be moving in soon. At least we can go in and look around and remember what was. And maybe order a slice. The Roma site acknowledges the history of the space they're inhabiting. The language is weirdly jumbled, but what the hell: "Zito Bakery. If you look on google or ask the New Yorkers, I will answer that was one of the earliest and most famous bakeries in the historic city. Pictures of Zito sell them on the road next to the statue of liberty or Dellal Empire state building. Pizza Roma will give new life to this famous bakery where they used to buy bread and myths like Frank Sinatra and ordinary people. This asset is an asset that will use during launch and opening communication."